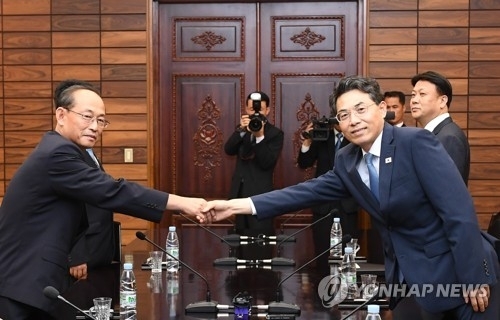 SEOUL, June 28 (Yonhap) -- The two Koreas agreed Thursday to conduct a joint study on modernizing and connecting cross-border roads as part of efforts to carry out agreements reached by their leaders in recent summit talks. They also agreed to modernize the Kaesong-Pyongyang section of the northern side of roads in the western region and the Wonsan-Goseong section of roads running through their eastern border. The agreements were reached as the two Koreas held working-level talks at the truce village of Panmunjom to discuss road-related cooperation. A joint study will be conducted first on the roads in the western area early in August and then on those in the eastern region. Designs and other work will also be carried out, and the launch of construction will start "at an early date" when necessary preparations are completed. The two shared the view that cooperation on modernizing and connecting their cross-border roads is important to achieving "balanced development" and "co-prosperity," they said in a joint press statement. The meeting on cooperation on roads is the latest in a flurry of working-level inter-Korean talks following their leaders' historic summit in April, at which they agreed to expand cooperation and exchanges in diverse areas. On Tuesday, the two Koreas held talks on railway-related cooperation and agreed to conduct a joint study on modernizing the northern sections of railways in eastern and western areas of the Korean Peninsula. Infrastructure is expected to play an important role in boosting inter-Korean exchanges going forward. Roads and railways in North Korea are said to be decrepit and require lots of repair work. The two sides, however, did not mention any plan to construct roads between the North's Kaesong and Munsan, just south of the inter-Korean border. The 19-kilometer route, if completed, would allow vehicles to drive from Seoul all the way to Pyongyang. The two Koreas pursued construction of the road section in 2015, but it has been mothballed since early 2016, when the North conducted its fourth nuclear blast test. They still agreed to work together to develop technologies needed for road modernization and to continue to communicate to tackle any problems that could arise in the process of pushing for the joint projects. Vice Transport Minister Kim Jeong-ryeol led South Korea's delegation to the talks. His North Korean counterpart was Pak Ho-yong, vice minister for land and environmental protection.